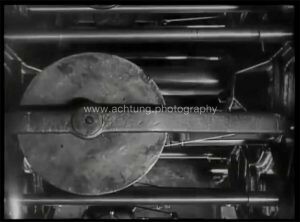 It is almost impossible to define Germaine Krull’s photographic style, as she embraced so many themes and genres and created such a varying body of work: From her early portraits and female nudes (Der Akt, Études de nu) created in the1910s, to her “iron” pictures (Métal) from the 1920s and ‘30s. Her street photography and editorial work for magazines, as well as her advertising, still life and travel photography prove her to be one of the most versatile photographers of her generation. 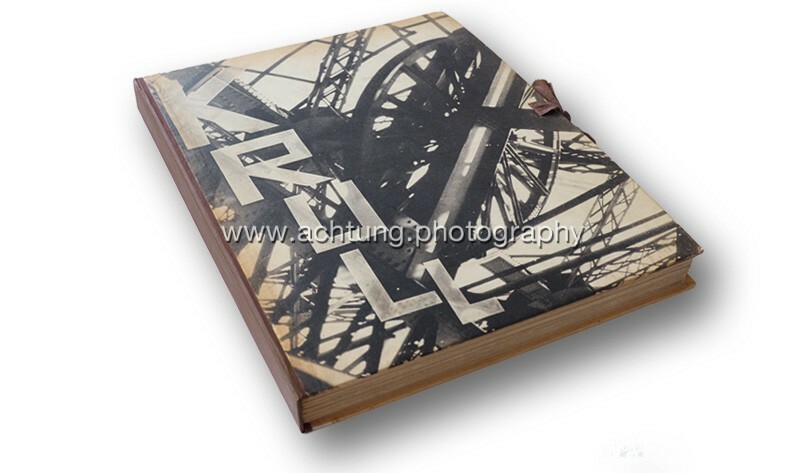 Krull’s photographs, whether of bridges, cranes, or the Eiffel Tower, tend towards the unconventional. It seems as if her initial approach is quite conservative, but then she questions common rules of composition, avoiding the more obvious ways her subjects would have been photographed at the time. Krull consequently avoids implementing a strict visual language. Instead of striving for a “realistic” documentation of her subject in her photographs she chooses her angles instinctively, cropping the images tightly, or even reversing them. It is exactly this unexpected approach that makes Métal stand out. Most plates show one image (except plate 10 which contains two images) and have the title KRULL, MÉTAL printed top left and are numbered right top. The publisher A. CALAVAS, PARIS is mentioned on the bottom right corner of each plate. There appear to have been at least two versions of the portfolio. One with a black spine and band, and one with a brown spine and band. The brown cloth version (shown below) seems to be the rarer of the two. 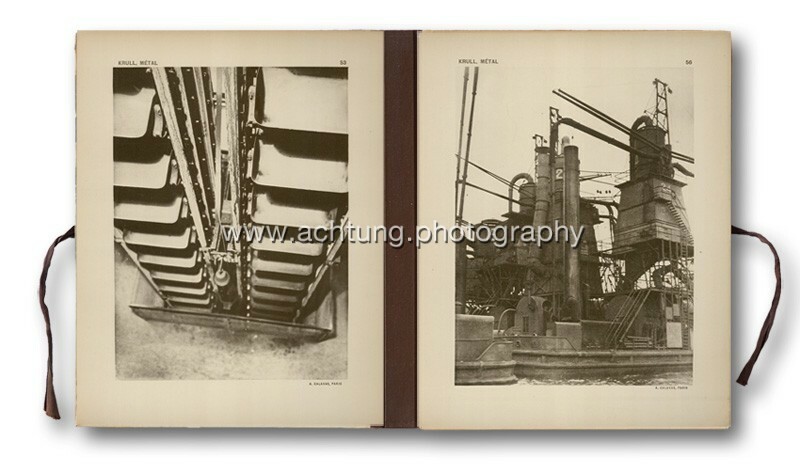 The portfolio consists of 64 plates with images printed on one side, and two folded sheets unbound resulting in 8 pages which include a two and a half page text by Florent Fels in French and a short explanatory text by Germaine Krull. 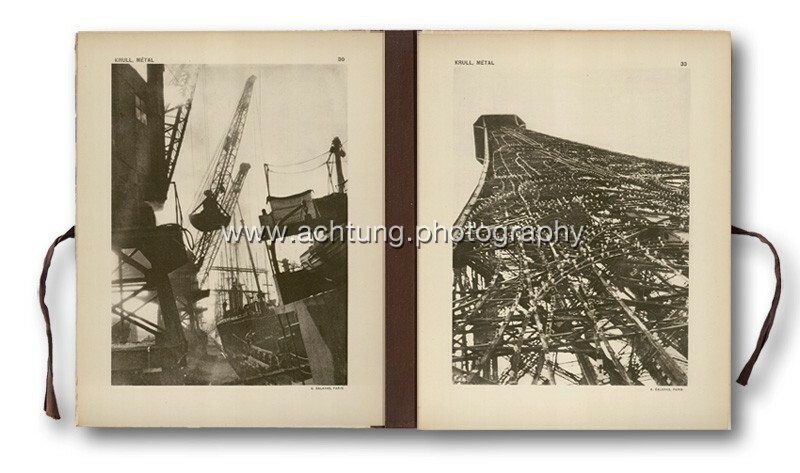 La Tour Eiffel, les grues et ponts transbordeurs d’Amsterdam, Rotterdam, Marseille et Saint-Malo m’ont fourni la matière d’un certain nombre des planches dont est formé cet album. Je suis redevable des autres à l’extrême obligeance avec laquelle m’ont accueillie M. le Directeur du Conservatoire des Arts-et-Métiers dens son musée, M. le Directeur de la C. P. D. E. à la Centrale électrique de Saint-Quen, M. André Citroën dans ses usines. La couverture du livre est une composition de M. Tchimoukow. 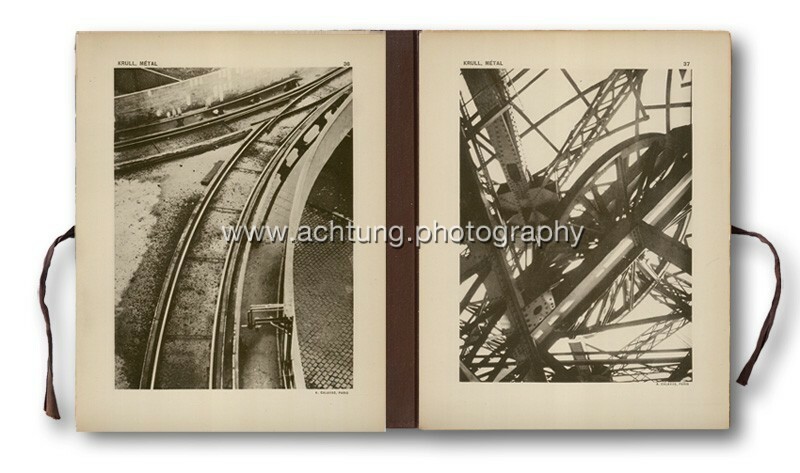 The Eiffel Tower, the cranes and bridges of Amsterdam, Rotterdam, Marseille and Saint-Malo provided me with the material for a number of plates which form this album. 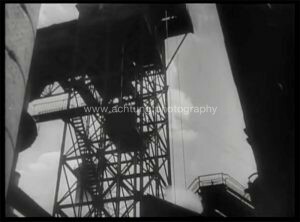 I am indebted to others for the extreme kindness with which I was welcomed, by the Director of the Conservatoire des Arts-et-Métiers to his museum, by the Director of the CPDE at the Saint-Quen Power Station, and by M. André Citroën in his factories. 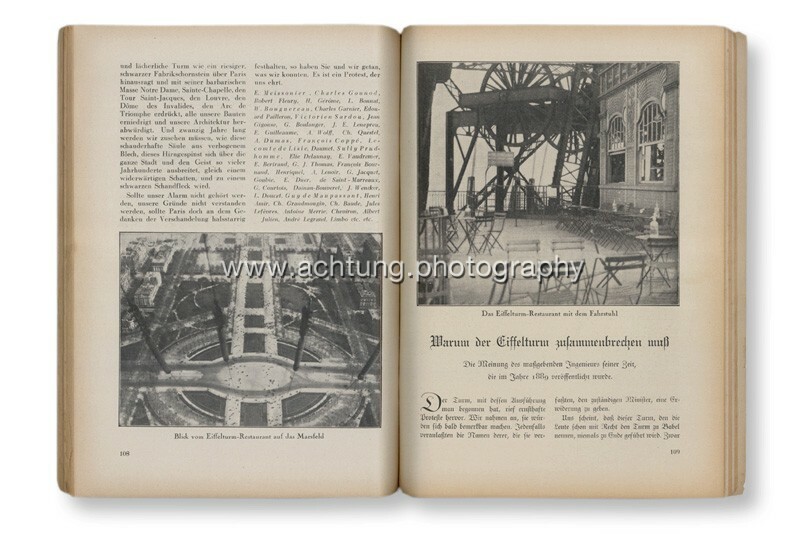 This six page article in German UHU magazine is a great example of an early publication of Germain Krull’s Eiffel tower photographs. 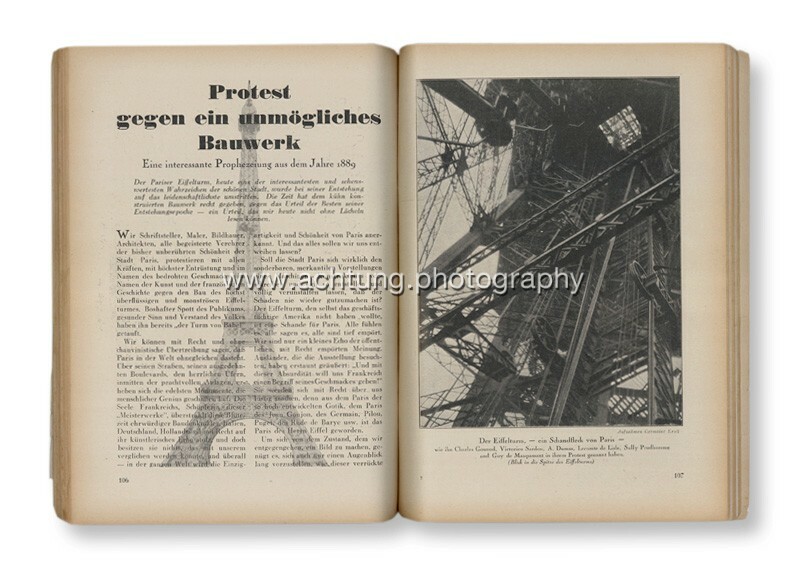 The images illustrate an article entitled Protest gegen ein unmögliches Bauwerk (protest against an impossible* building) concerning the criticism and controversy surrounding the building of the Eiffel tower (1887-1889). A one page article by engineer L. Emners from 1889 explains how such a structure could never be realized. The image on page 107 was also published in the Métal portfolio as plate 2.
wie ihn Charles Gounod, Victorien Sardou, A. Dumas, Lecompte de Lisle, Sully Prudhomme, und Guy de Maupassant in ihrem Protest genannt haben. Das Eiffelturm-Restaurant mit dem Fahrstuhl. 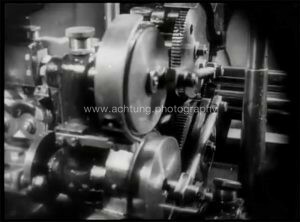 Die Meinung des maßgeblichen Ingenieurs seiner Zeit, die im Jahre 1889 veröffentlicht wurde. 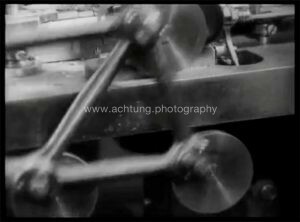 Urteil eines maßgeblichen Ingenieurs aus der Entstehungszeit des Eiffelturms. 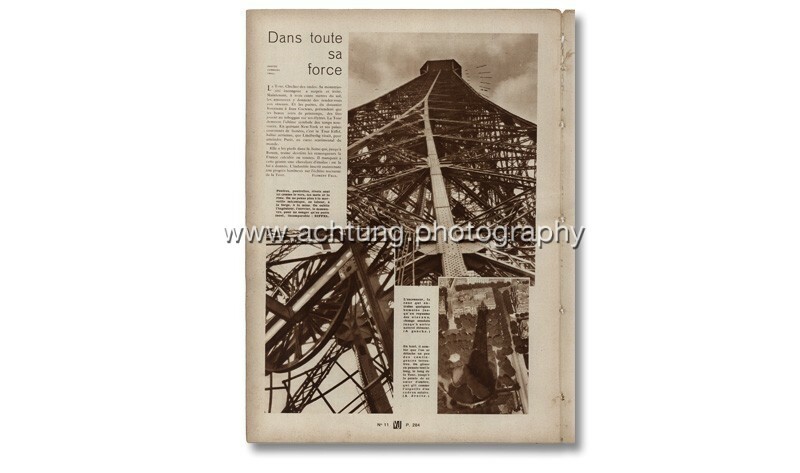 The French magazine VU published an article in issue 11, 30th May 1928 (page 284) entitled Dans toute sa force (In all its strength) by Florent Fels using three of Krull’s Eiffel Tower photographs. 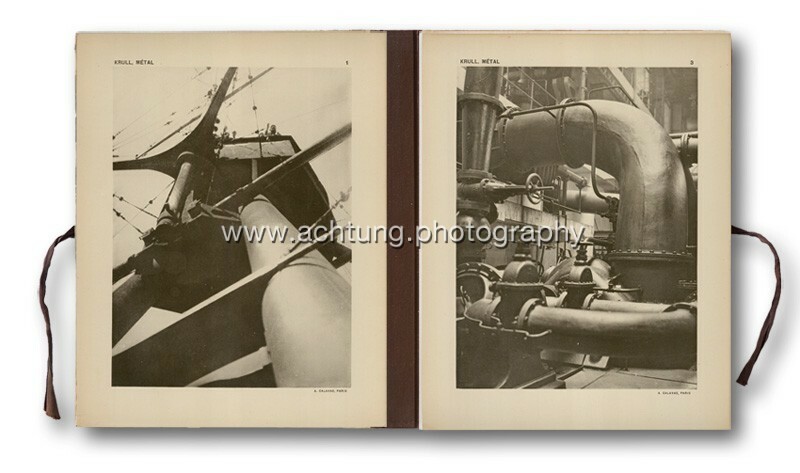 Here you see the image which was on the portfolio cover (also plate 37) actually printed the right way around, and a variation of plate 33 from the Métal portfolio. 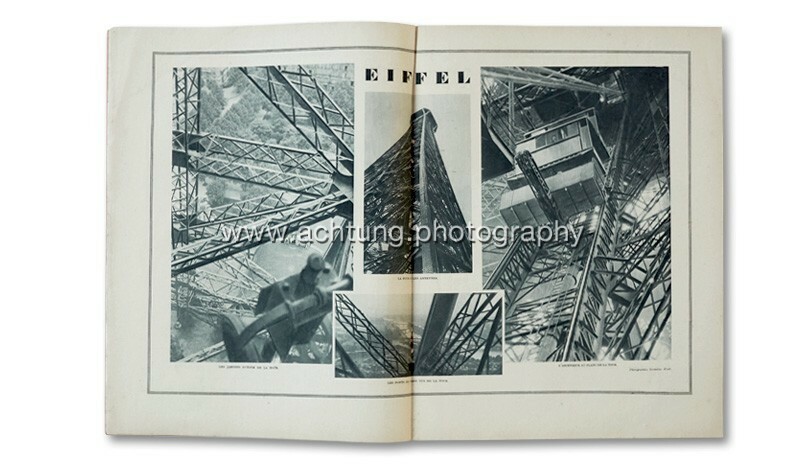 The French art magazine L’Art Vivant (Published by Librairie Larousse, Paris) used one of Krull’s Eiffel Tower photographs on the cover of their October 1928 issue. 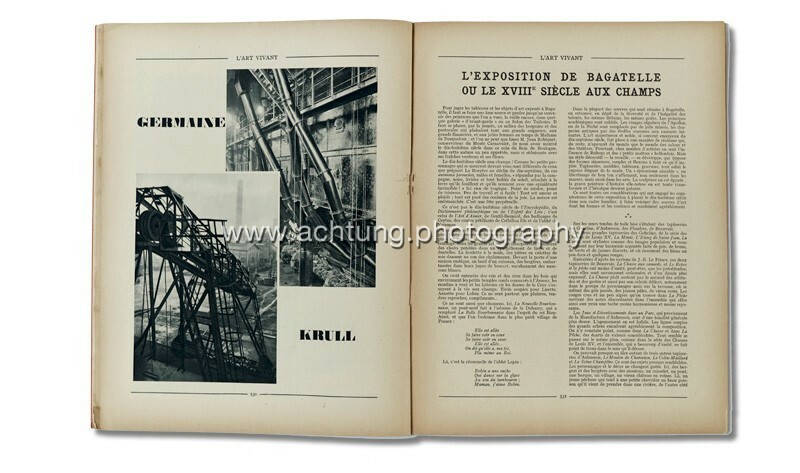 They also published four of Krull’s Eiffel Tower pictures on a double page inside the magazine. 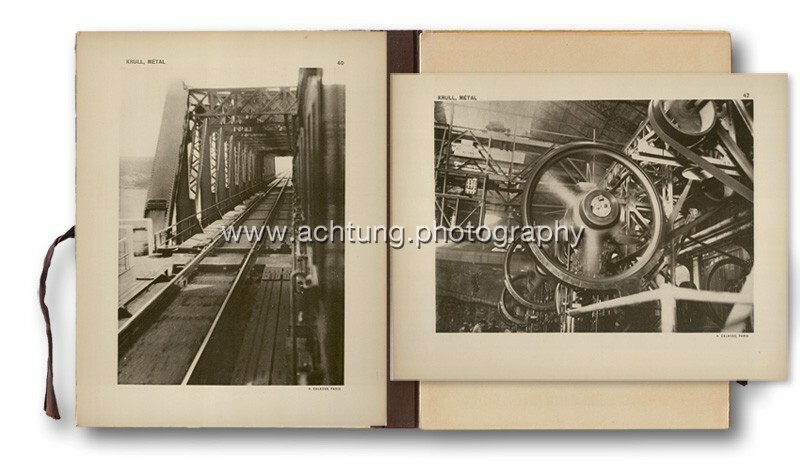 Those pictures are not included in the Métal portfolio. 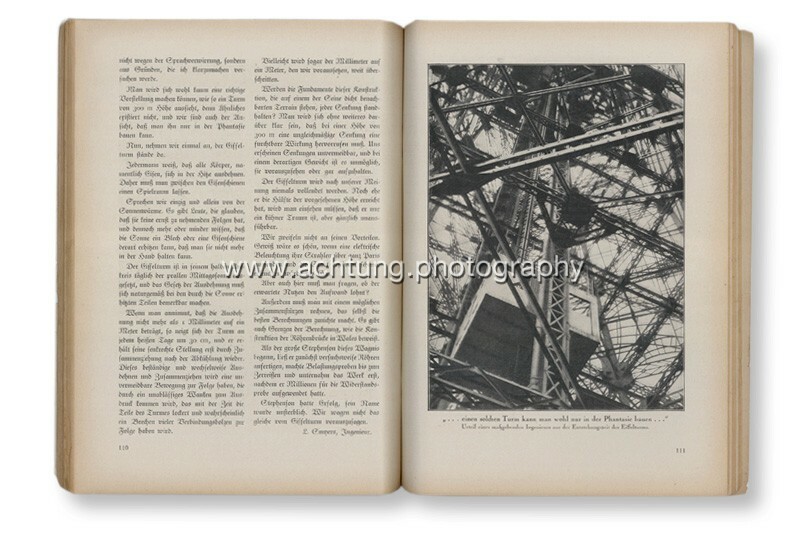 Two of Krull’s Eiffel Tower photographs were included in the book Paris published by Albertus Verlag, Berlin 1928 as part of their “Das Gesicht der Städte” series. 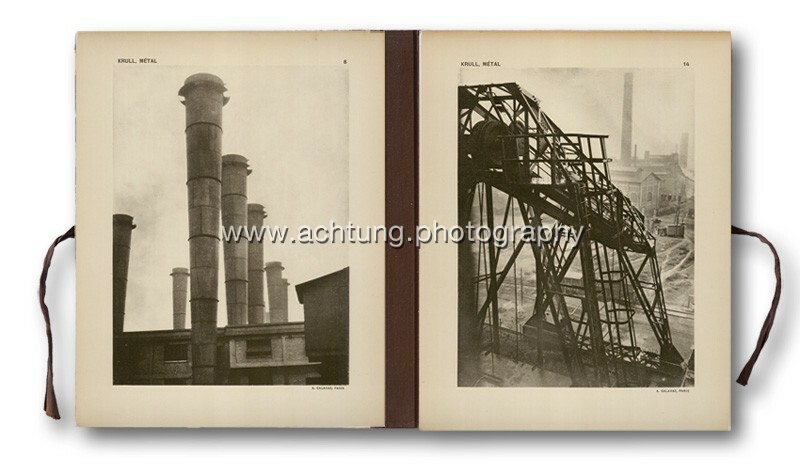 Mario von Bucovich is the main author and most photographs are by him. 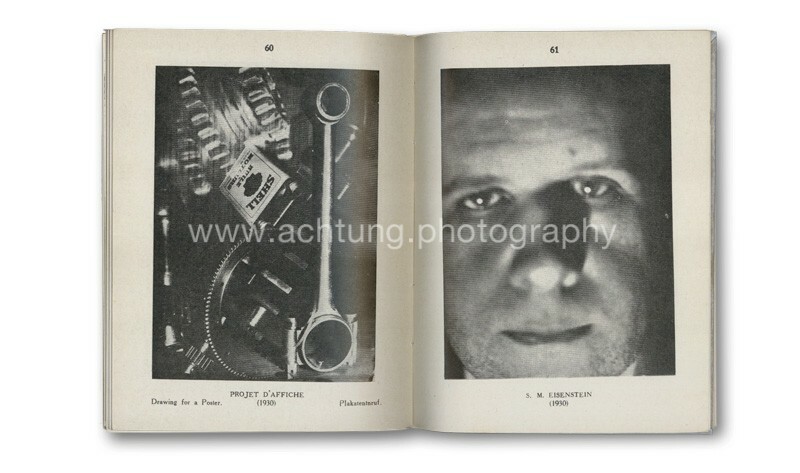 Twenty-three images by Germaine Krull were included, as well as one by A. I. Saraiva, London and one by Braun et. Cie., Paris. 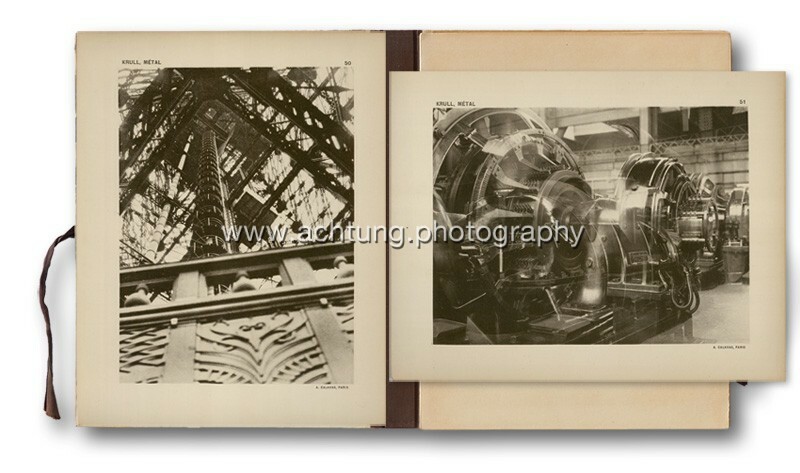 Krull’s two photographs of the Eiffel Tower are not included in her Métal portfolio. 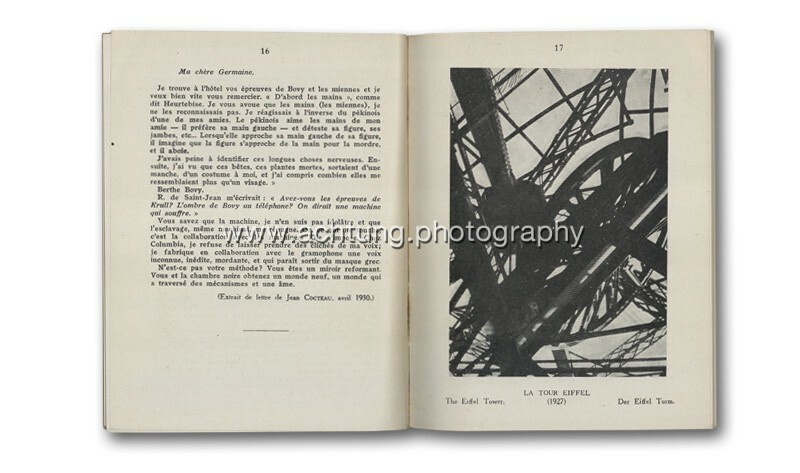 The image on the left page was also published in the French magazine VU Issue 11, 30th May 1928 on page 284. 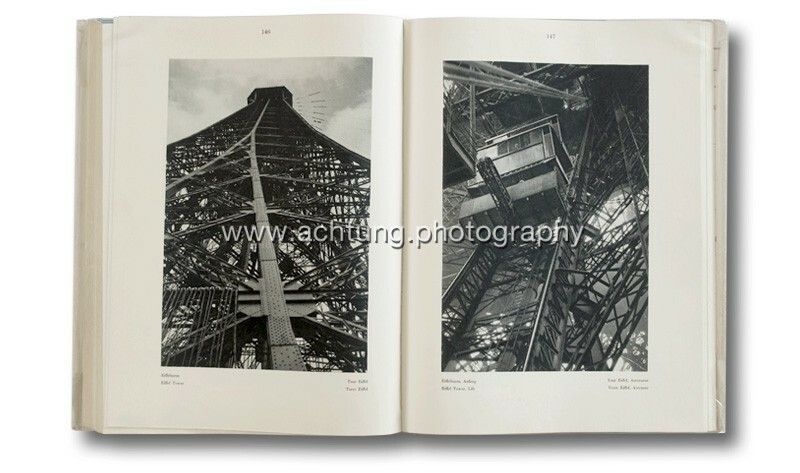 The image of the Eiffel Tower elevator on the right page was also published in L`Art Vivant No. 91 1st October 1928 (page 757). US edition by Random House, New York 1930. 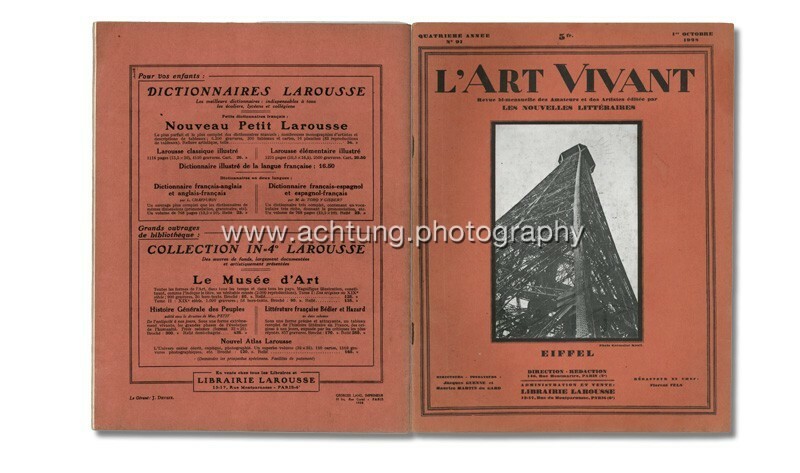 The French art magazine L’Art Vivant No. 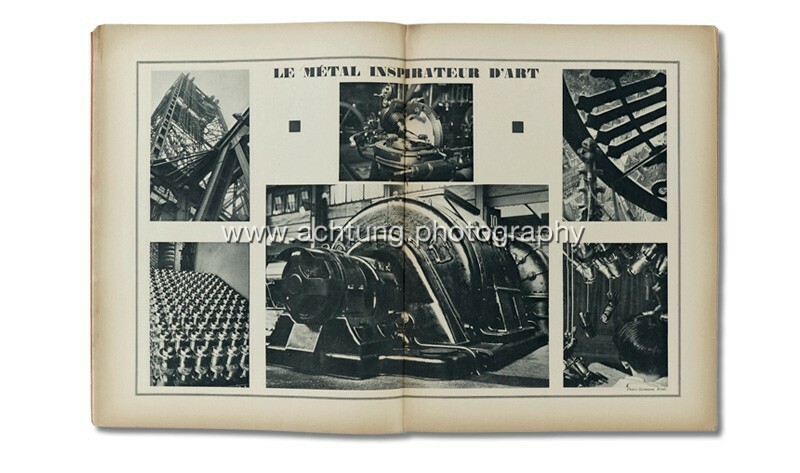 105 1st May 1929 (Published by Librairie Larousse, Paris) featured an article entitled LE MÉTAL INSPIRATEUR D’ART by Charles Saunier. 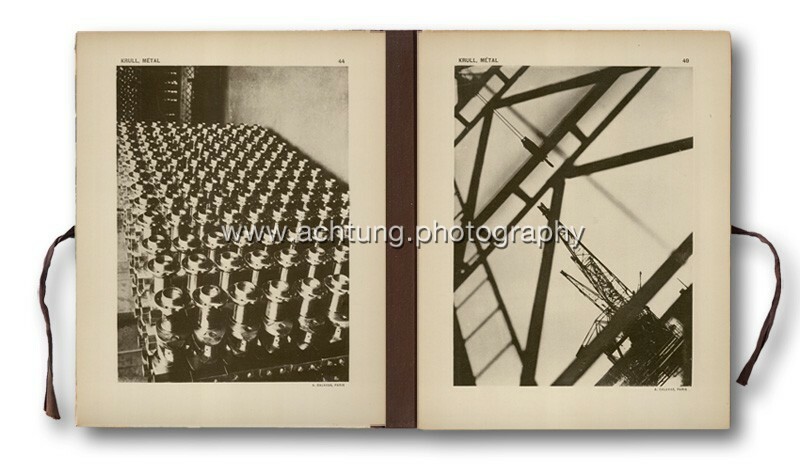 Six pictures from Germain Krull were used for the cover and the center double spread. 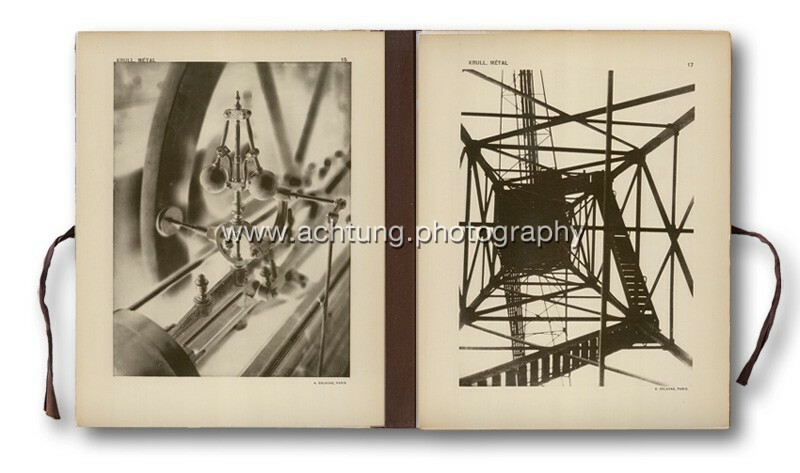 Four of these images are also included in the Métal Portfolio (Plates 6, 10, 35, 44). 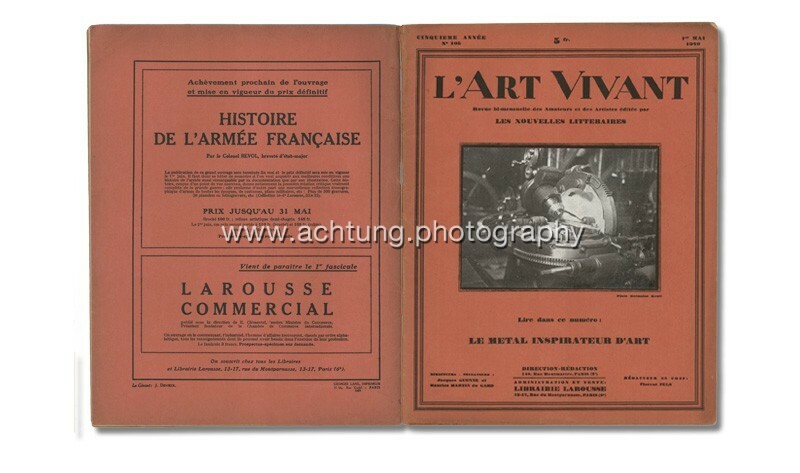 Two images from the Métal Portfolio (Plates 14 & 23) were featured in the French art magazine L’Art Vivant issue No. 109 1st July 1929. 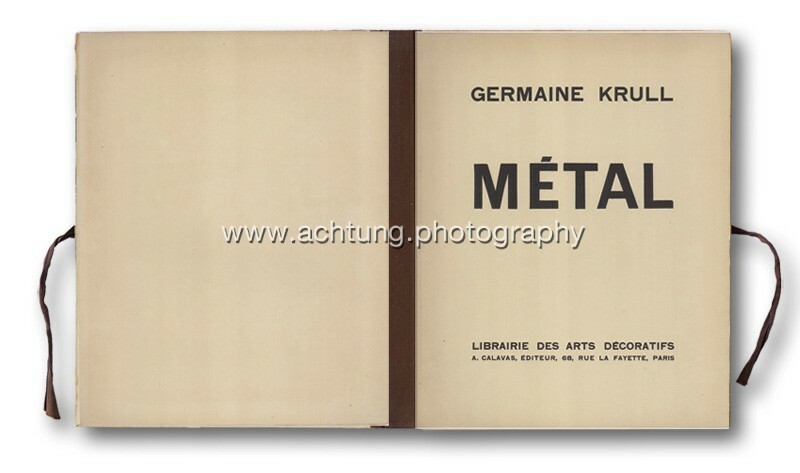 The cover image of the Métal portfolio (also plate 37) appears on page 17 in the small format book Photographes Nouveaux – Germaine Krull, by Pierre Mac Orlan published by Librairie Gallimard 1931. 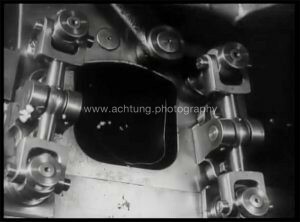 The image “Shell” that was included in 50 copies of the re-publication of Métal in 2002-3 is published here on page 60 entitled PROJECT D’AFFICHE (1930) – Drawing for a Poster. 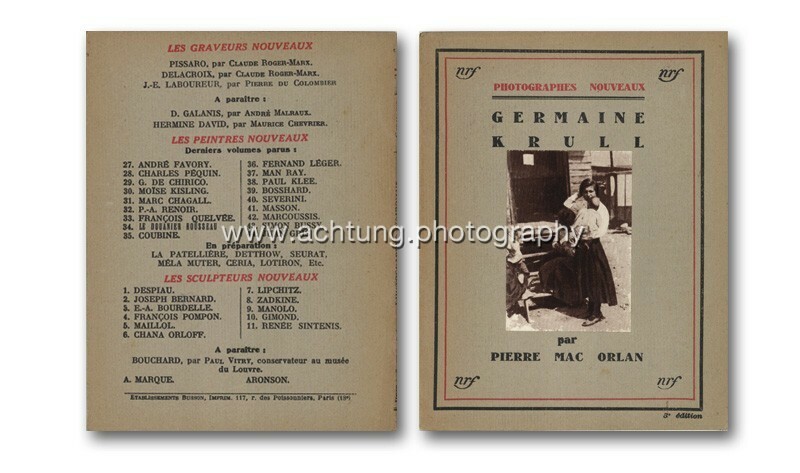 One of Germaine Krull’s nudes entitled Étude Mai 1930 is shown on page 51. 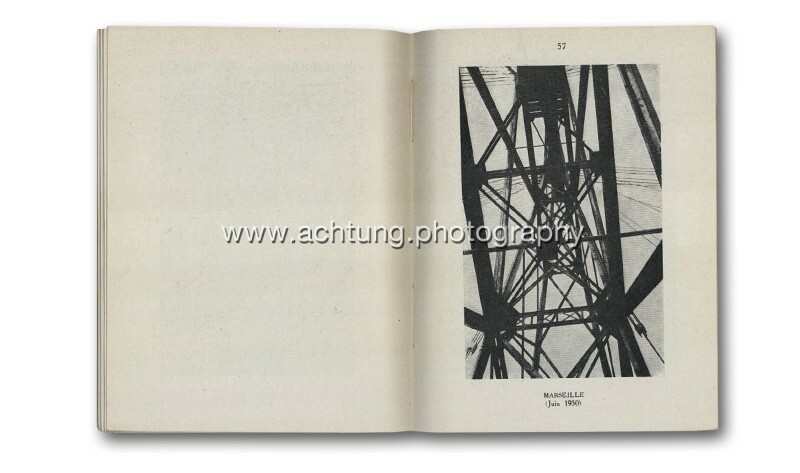 A facsimile edition of Métal was published in an edition of 1000 copies by Ann and Jürgen Wilde 2002-3. 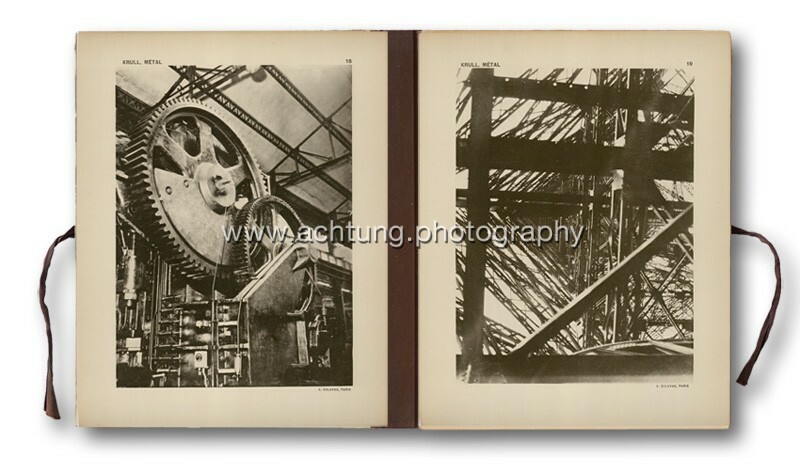 This re-publication of Métal was already planned for publication by German photography collectors and supporters Ann and Jürgen Wilde, together with Germaine Krull, in the late 1970s, but it took 25 years to finally appear in print. 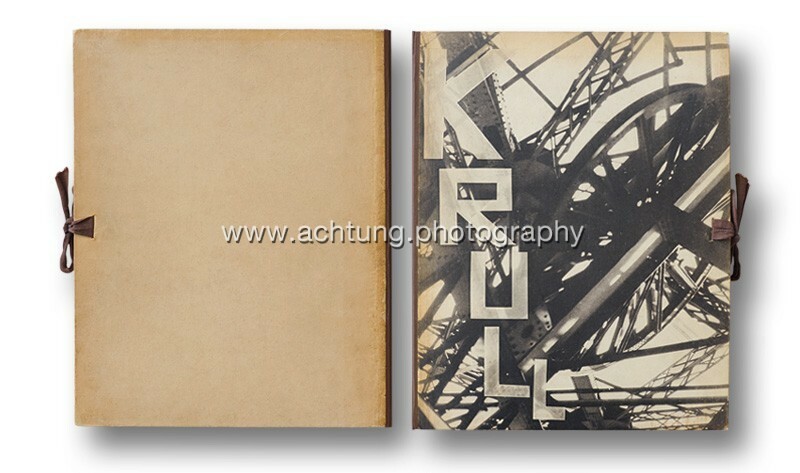 50 copies including a 16 x 21cm silver gelatin print “Shell” shot in 1929, and printed and signed by Germaine Krull in 1978. 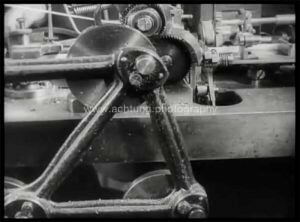 Interesting visual parallels to Germain Krull’s Métal images can be found in Soviet filmmaker Dziga Vertov’s* MAN WITH A MOVIE CAMERA from 1929. 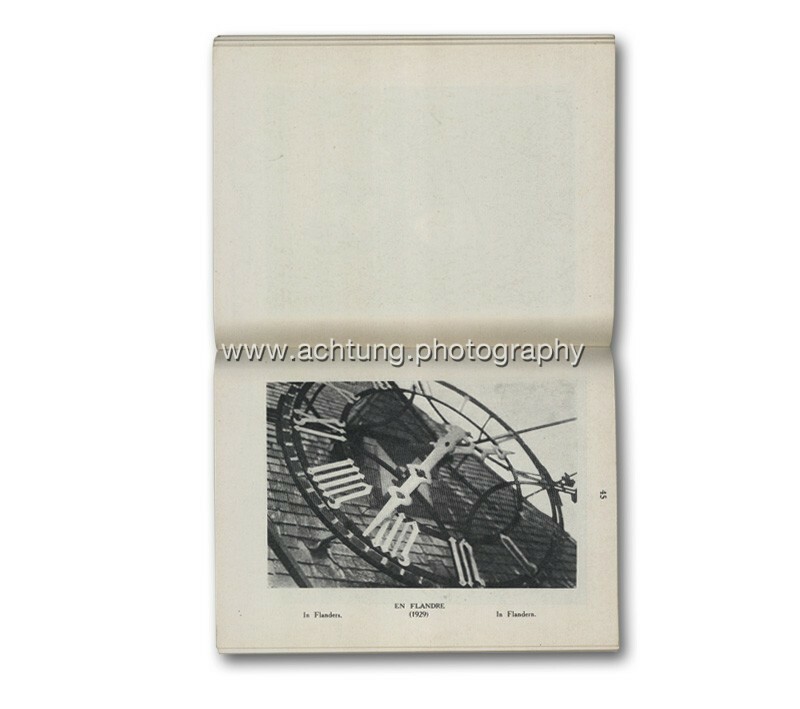 I would like to thank Katharina Tilemann from Querschnitt-Antiquariat Berlin for her kind support.